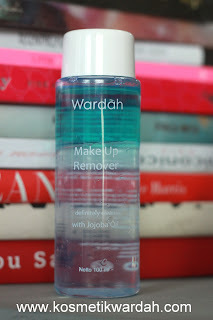 For those of you who like the consistency of Maybelline and L’Oreal eye makeup remover, you’re definitely going to love the new Make Up Remover from Wardah. I’m not going to write a lengthy review on this one, since it’s pretty straightforward. 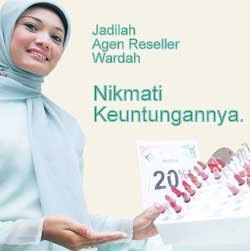 Wardah Make Up Remover is a clear liquid with greenish blue oil that separates on the top part of the bottle. It’s 100ml and packaged in a screw top bottle. When you move the bottle around you’ll see that the two liquid is completely separated, hence my reference to the Maybelline and L’Oreal eye makeup remover that looks pretty much the same. It has a nice faint scent that you can barely smell. To use this makeup remover, shake the bottle until the two liquid mix well together. Pour quite reasonable amount of the product to a cotton pad and to remove eye makeup hold still the pad for around 30 seconds so that the eye makeup dissolve well to the cotton pad. Use the other side of the cotton pad to remove eye makeup on your other eye. For face, you’ll need another cotton pad to remove all the makeup. 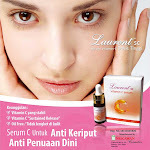 The product contains jojoba oil that feel relaxing and hydrating on the skin, and I suspect is also the source for the nice faint smell of the product. It’s also alcohol free so it doesn’t feel drying on my skin. After all, the best makeup remover are those that is hydrating and free of alcohol because we’re going to use this product on our eyes and lips area which have thinner skin and the rest of our body. Thus, products that contains alcohol and doesn’t hydrate well tend to lead to irritation and can reduce our skin’s hydration. I don’t experience any irritation and I don’t see any pores getting clogged from using this product. Then again, I’m a believer in a double cleansing routine, so even after I took off my makeup with this remover I still washed my face with foaming wash.
My verdict on this remover? I find this relatively more hydrating than the Maybelline and L’Oreal eye makeup remover and the smell is more pleasing as well. The real big bonus for me is because I can use this for all over face. However it doesn’t cleanse eye makeup as fast as Maybelline and L’Oreal eye makeup remover. Although, when you leave your cotton pad on your eyes for a while it will lift up the eye makeup thoroughly. Definitely a handy makeup remover to have within your reach. The only thing that I would love to see from this product is the improvement of its packaging to flip top bottle so it’s easier to use.